The call of the ocean or an escape to the country, Le Jacquard Francais' depiction of nature in its new collection of table linens is an invitation to spend as much time as possible around the table. Lunchtime toes in the sand ... the sea has washed ashore a multitude of little treasures for the children to find before sitting down to eat at Escale Marine. Romantic nature inspired florals with birds, butterflies and snails in an ornamental lace-like border fancy Romance. Mint, Cherry, Apricot ... colorful large madras-style tiles tumble across the table. 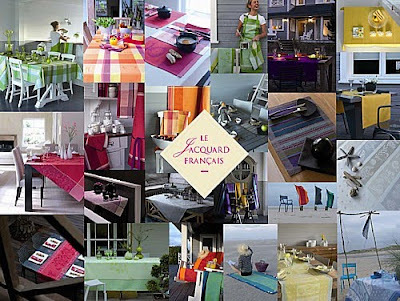 View the new Le Jacquard Francais 2010 Collection and dine in color.